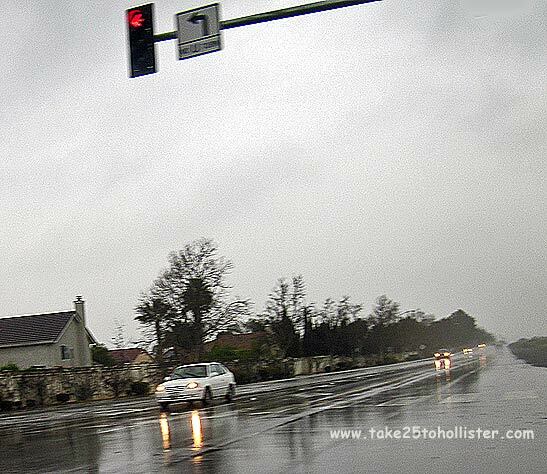 Take 25 to Hollister: Rain! We hadn't seen a tempestuous rainfall as we did last weekend in a long time. Maybe some of you heard about the flooding in Hollister which actually made national, news. A creek flooded about 10 miles north of downtown in a rural area, causing more than 100 residents, with their pets, horses, and other small animals, to evacuate. All is getting back towards normal, as far as I've heard. 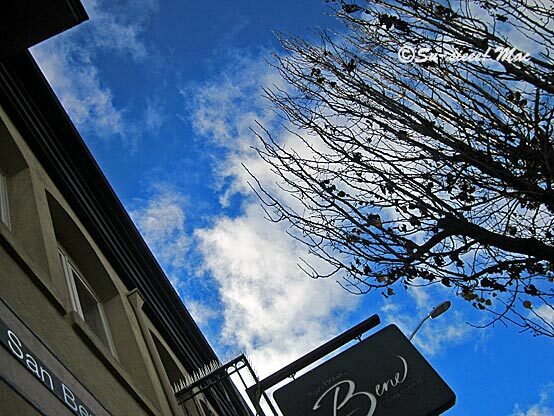 In the photo, the sign for San Benito Bene also speaks well of the sky above downtown Hollister a few days ago. Yup, we've had delightful sunshine. Just enough to get us ready for this next one, which some weather guys say will start tomorrow and continue to possibly next Tuesday. 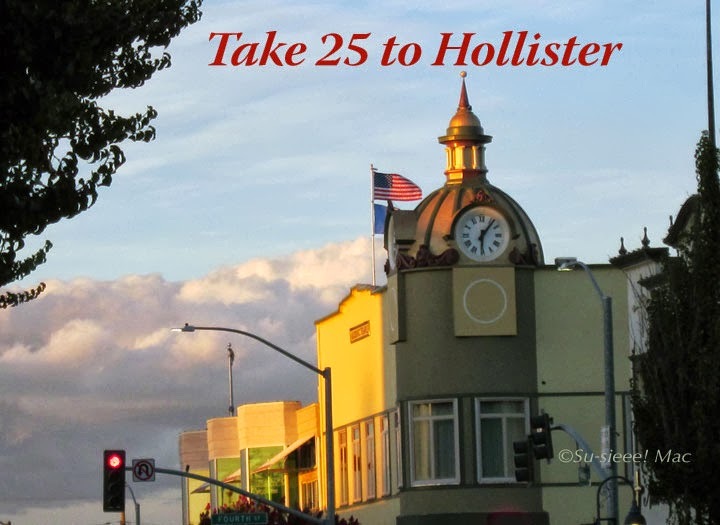 Where ever you are, dear Take 25 to Hollister readers, may you be warm and dry. 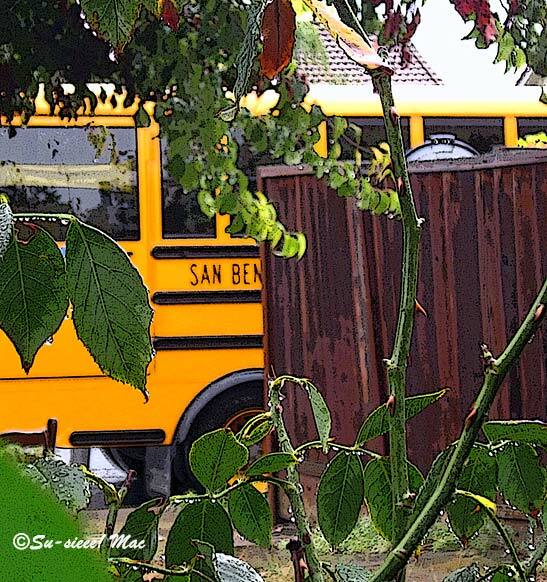 I spy with my little eye this morning happy raindrops and a happy yellow elementary school bus. Didn't you love all the rain this morning? Hope there's a lot more on the way. 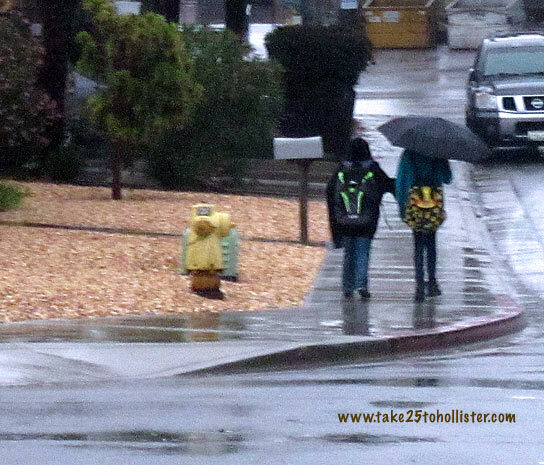 This past Friday was one of our wonderful rainy days (just like today). 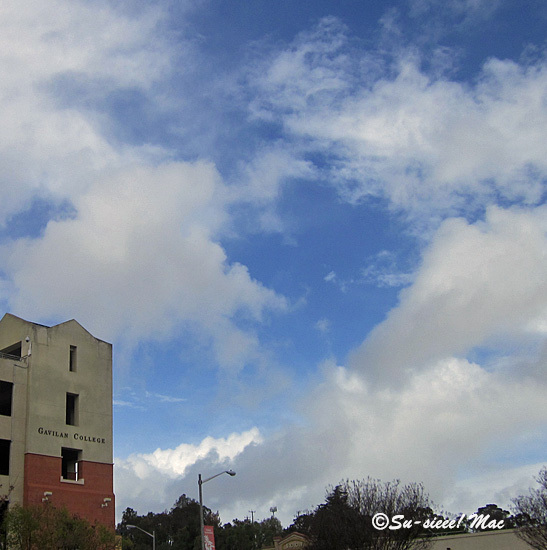 When I was downtown, I took this shot of blue sky breaking through the clouds north of town while grey clouds were bringing rain south of us. The weather report says it'll be raining a lot this morning and again in the evening. Be careful out there. Slow and easy, please. We had a wonderful rainy day yesterday. 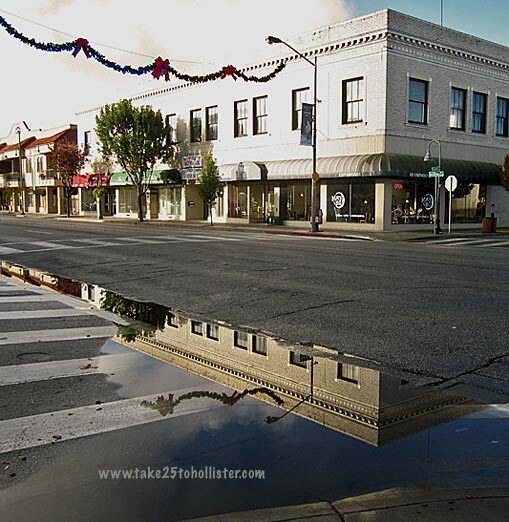 It gave us at least one great reflection in Downtown Hollister this morning. This is the view from the corner of Union Road and Highway 25. Hurrah! 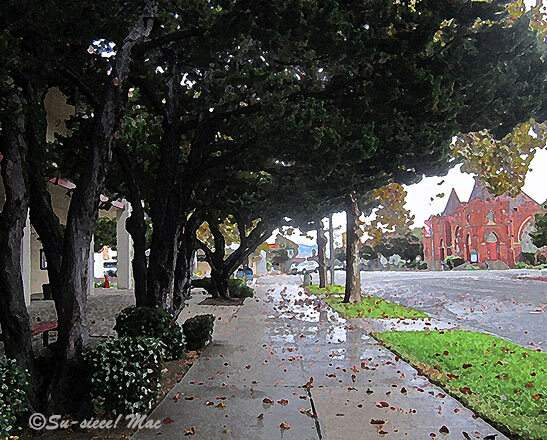 Here was the afternoon calm in Downtown Hollister after the steady showers we had on Monday. Right now, the weather guys are reporting a 50% chance of rain for tomorrow. Knock on wood. This past Monday not only brought us rain, but also, finally, the feel of Autumn. At least for me. The dry, colorful leaves scooting across the sidewalk and streets. The crisp, cool air. Brrr. It has been raining steadily since very early this morning. What a welcome surprise, huh? 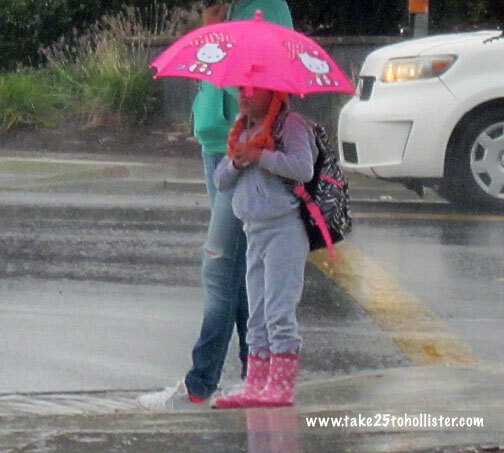 Weather reports say that showers will continue through the day and possibly into the evening. We may also get some thunderstorm, too. Weather reports show clear days for the rest of the week. So, enjoy the rainy day. 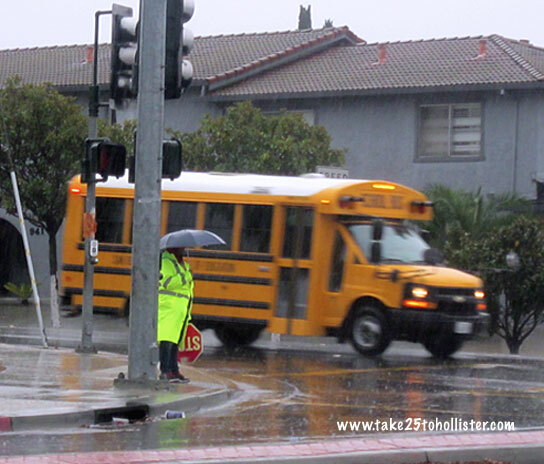 Labels: 365(2015), drought, environment, neighborhood walk, Rain! It rained, I was told. It was short but a very heavy pour. I may not have heard or seen it, but I saw signs of rain on the flowers and on the cement and ground in our backyard this morning. 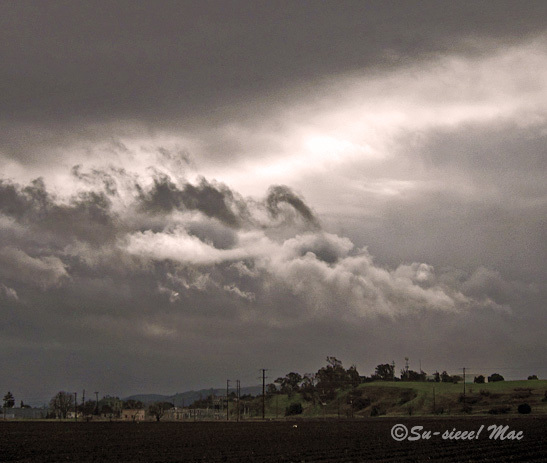 And, the clouds almost looked like they were asking, "So, how'd you like that rain?" I liked it a lot, thank you very much. 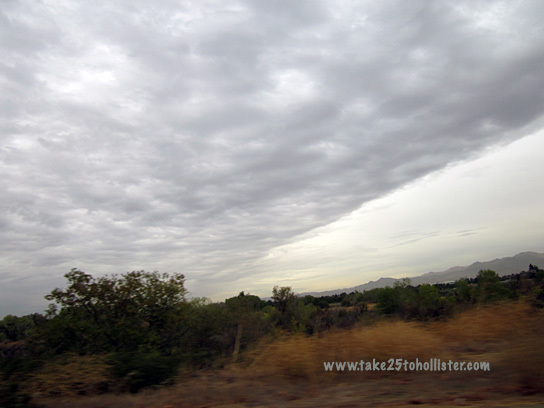 These grey clouds yesterday afternoon multiplied and intensified to give us rain last night! Whooo-hooo! It rained through the night. Yaaay! We even had some rain this morning. Who knows, we may have more today. Hurrah! Yesterday marked a full day and night of rainfall. One weather caster called it a storm. Perhaps in some areas. 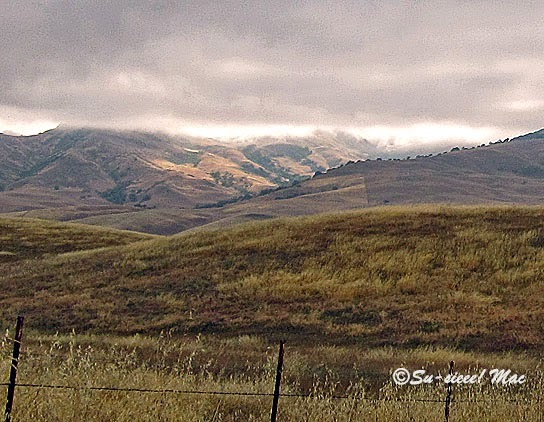 To me, it was a delightful, gentle, steady Spring rain that gave joyful reprieve to the parched hillsides. From the Archives -- Drought! 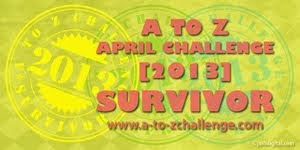 My blogging brain is spent from participating in last month's Blogging from A to Z April Challenge with both Take 25 to Hollister and The View from the Top of the Ladder. So, for the next several days, I shall post past stories from my archives. 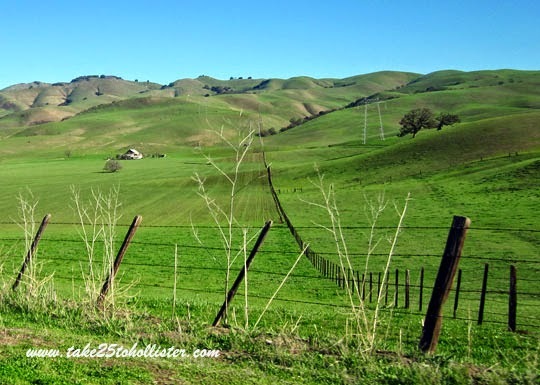 Do you recall that we were going through a "significant" drought throughout California from 2007 to 2009? Significant is in quotes because that's how the California Department of Water Resources described it. I'm wondering if we even got out of that drought condition from back then. What do you think? A little bit of thunder and rain. Yippyy!! A loud Ka-POW! woke me up early yesterday morning. The Husband reassured me it was. I was happy. It has been a long while since I had heard something like that. “Yes,” said the Husband. “Rain.” Deliriously joyed, I fell back to sleep. Unfortunately, the next time I woke up, the day was brightly shining. The ground and pavement were wet so that was good. Needless to say, the plants were happy, happy. You bet rain is a big thing. We're going through a d-r-o-u-g-h-t, again. Normally, the rain would’ve stayed throughout the whole weekend and maybe even into the following week. For now, we look at the billowy clouds with hope. Labels: 365(2015), drought, from archives, Rain! The weather has been beautiful the last several days that if it weren't for this photo I would've forgotten that we did have a few days of rain. 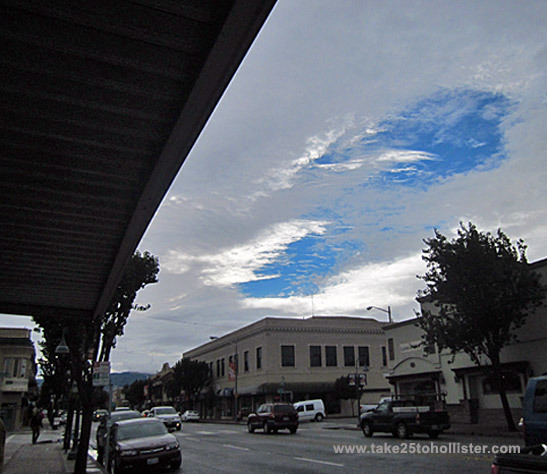 Were the rain clouds gathering or breaking over Downtown Hollister? I can't recall. Hopefully, we'll have a lot more early spring rains to lessen the drought. 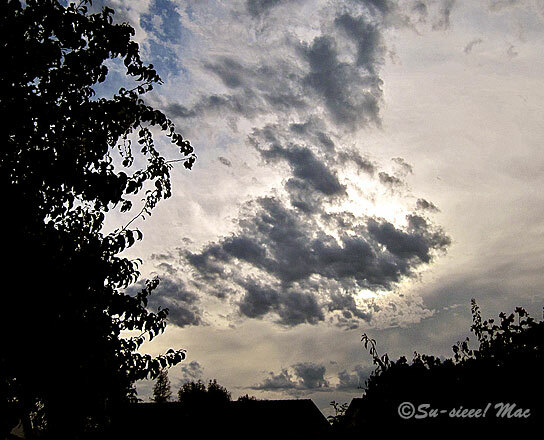 Today I'm hooking up with Skywatch Friday. Click here to check out the skies around the world. Our drought is far from over. There is a good but though and it is this: But, our hills are green, green, green! I cannot repeat myself enough. To me that means we are approaching normal -- as normal as can be. Last year, our hills were dead brown, which was unusual, and they stayed that way for a few months. So, yippie ki-yay! for the rain that came our way this past month. To one and all, Peace and Joy, as we embark on our new trip around the sun! Today, I am linking up at ABC Wednesday, which is hosted by Mrs. Nesbitt and her team of wonders. It's the letter Y today. Click here to read other Y posts by bloggers around the world. And, one more thing for you today: Below is my 2014 album at Facebook, showing some things that took place in our area throughout the year. 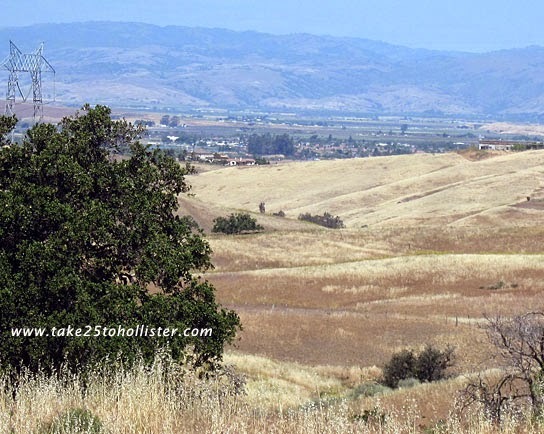 Post by Take 25 to Hollister, California. 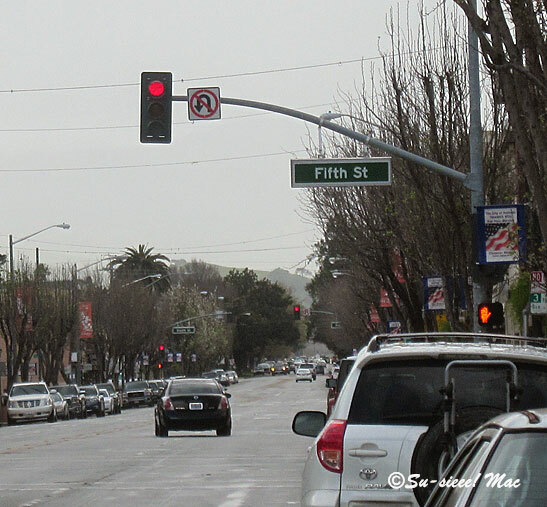 Last week, the rain created a pretty good size puddle at the corner of Fifth and Monterey. 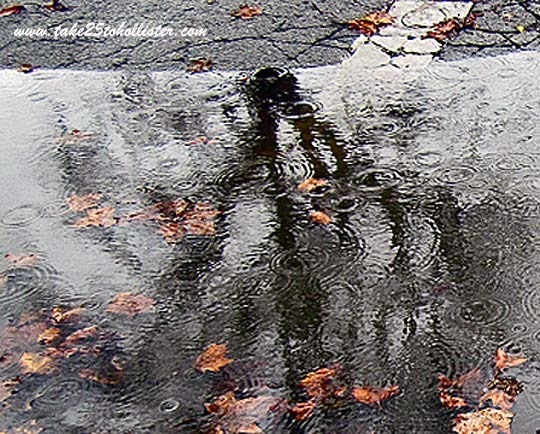 The puddle offered a cool reflection of a tree from across the street, as well as cool patterns from the rain. Do you see the face, by the way? 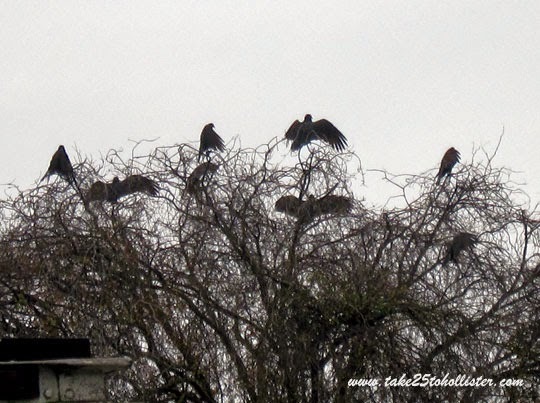 The other day I saw a bunch of crows hanging out in a tree around the corner from Vertigo Coffee in San Juan Bautista. The crows looked like they were trying to dry their feathers before it rained again. By the way, Vertigo is a comfy, cozy place to hang out and sip a cup of coffee and eat some yummy croissants, pizza, and other food, rain or shine. 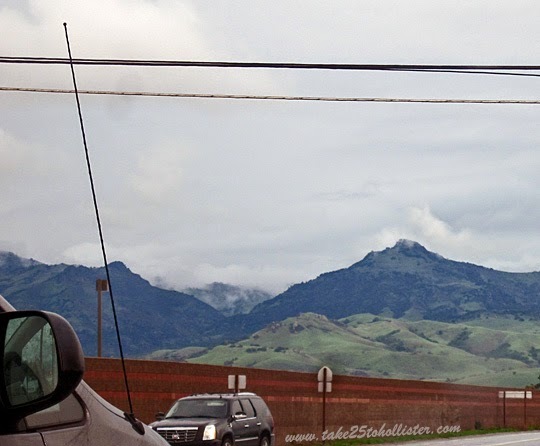 Thanks to last week's rainstorm, the hills and mountains are going green. Hurrah! 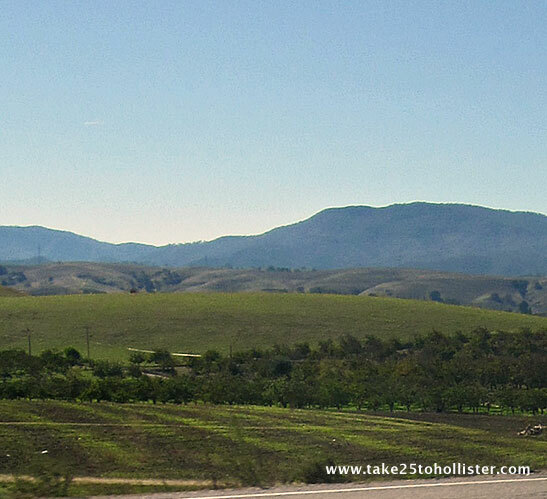 This is a view of Santa Ana Peak (part of the Diablo Range) from Highway 25. Yesterday's rainstorm was the best one in the longest time. It started raining around mid noon and was still steadily going at midnight when I nodded off to sleep. We could have more rain today. Hooray! 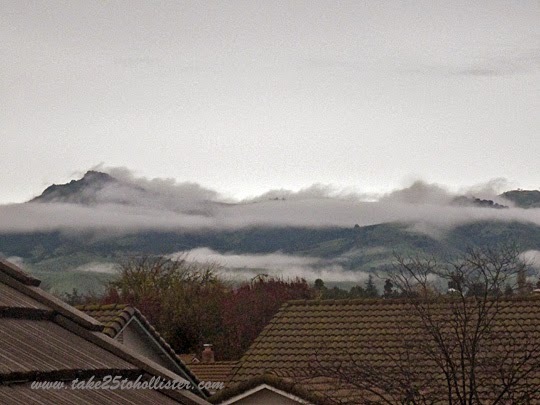 As I'm writing, clouds are sweeping across the Diablo range to the east of town. Lovely! 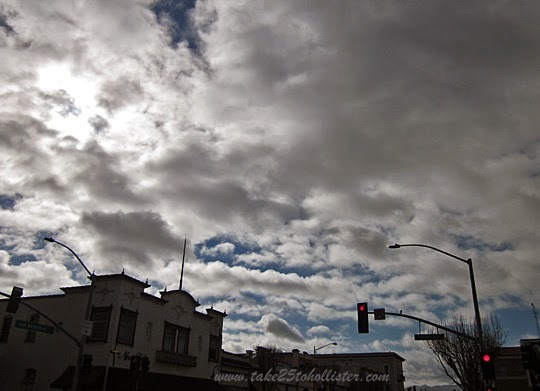 Today's link is Skywatch Friday. Click here to check out other parts of the world.